This recipe reminds me of trips to the mall we took as kids where we’d always get the greasy, fried, covered-in-sticky-sweet-sauce “Chinese food” the food court had to offer. It was one of my favorite foods and I had no idea it was so terribly unhealthy. Fried chicken basking in a sea of high fructose corn syrup sure tasted good. Oh well. Fast forward 15+ years and a plant-based diet or two later – let’s try that kind of food again, now, only a little better for you. And home made sauce! Oh, the homemade Asian-style sauces I’ve gotten so good at making! The sauce still contains sugar- but it’s real sugar, not corn syrup. 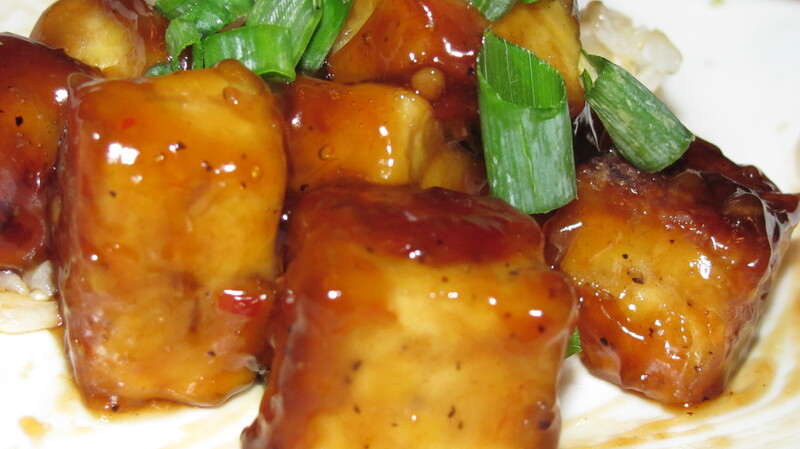 This recipe can be made with tempeh or tofu. Tempeh is another kind of vegetarian protein; it actually has more protein than tofu. It has a slightly bittersweet, nutty taste and does really well on the grill, also. Tempeh can be made of only soy beans, but I buy the 3-grain version made with soy beans, brown rice and barley. Cut tempeh into bite-sized pieces, about 1 inch. Pour flour out onto a plate and add salt and pepper to taste, mix well. Roll tempeh pieces in flour to coat well. Heat 3-4 tbsp extra-light tasting olive oil in a non-stick skillet. Brown tempeh well and remove from heat. Now it’s time to make the sauce. In a small pot, combine sugar, ketchup, chili sauce, rice wine vinegar, soy sauce, garlic powder and cornstarch. Make sure to mix the cornstarch in with about 2 tbsp water so it will combine effectively with the rest of the ingredients, and make sure to do it while all liquids are still cold. Trying to mix cornstarch into liquid that is already hot is going to result in 1) it not mixing and 2) a chunky mess. Heat on on medium heat until it begins to simmer and let it thicken to desired consistency (no more than about 5-7 minutes to heat it and thicken it. In a large bowl, add the tempeh and pour the sauce over the top. 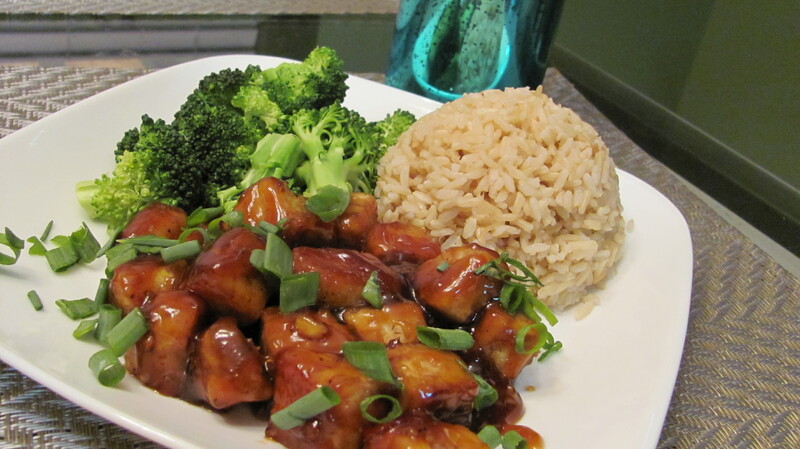 Mix well to coat each piece of tempeh and serve with steamed broccoli and brown rice.